The latest in Goodwin College student news, activities, events, clubs/organizations, and athletics! Plan to take part in a festival of art, music, and literature focusing on the Inter-War Period (1919 to 1939). The events, which will be held at Goodwin from September 24 to 26, include art exhibits, student artwork, museum displays, poetry readings, and musical performances. Free of charge and open to the public. Details to be posted soon. On September 24, 25, and 26, the RN-BSN program at Goodwin College will have its first accreditation visit by the Commission on Collegiate Nursing Education (CCNE). CCNE policy requires that institutions provide an opportunity for the program’s identified communities of interest (students, alumni, faculty, employers, etc.) to provide written input into the deliberations of the evaluation team. Written and signed third-party comments will be accepted by CCNE until August 25, 2014. Catherine Sneed, Accreditation Coordinator, Commission on Collegiate Nursing Education, 1 Dupont Circle NW, Suite 530, Washington, DC 20036. Please contact Rosemary Hathaway, RN-BSN Program Director, at 860-727-6738 or rhathaway@goodwin.edu with questions about the process. The MetroHartford Alliance and the Hartford Consortium for Higher Education is hosting a Startup Weekend on Sept 26 to 28 at the HELCo building, Sheldon Street, Hartford. This year’s Startup Weekend focuses on ideas to improve education by engaging students, faculty, and administrators to work with entrepreneurs from the private sectors. The event runs 6 p.m. on Friday to 7:30 p.m. on Sunday. Participants pitch ideas, form teams, and present business plans to a panel of judges. 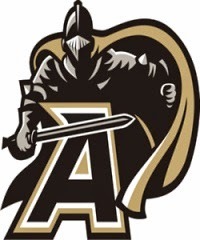 Student registration $25; other registrants $99. For more information, visit http://www.up.co/communities/usa/connecticut/startup-weekend/4114. Explore the outdoors, relax, see new places, get fit and meet new people! 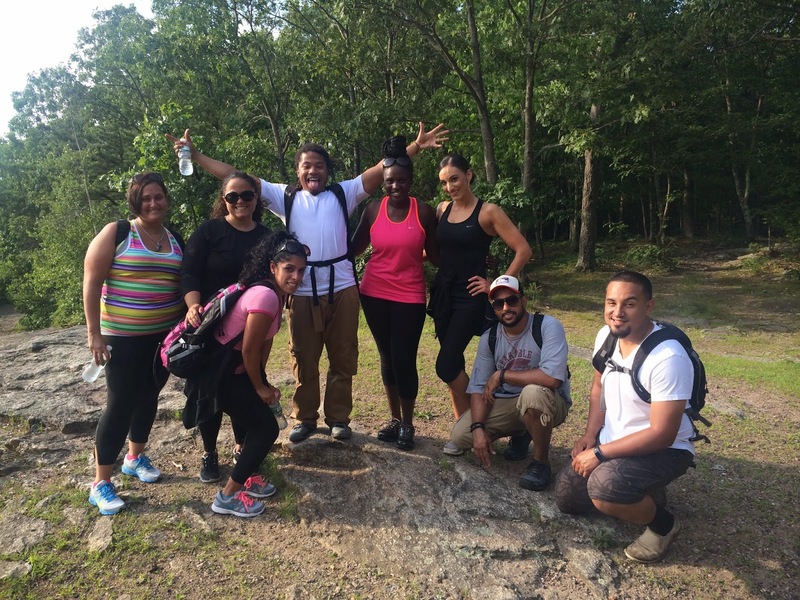 Join the Outdoors Club for hikes at various locations in Connecticut every other Wednesday. Check the student calendar on the Goodwin College website for details on locations and meetings times. For questions, please contact Lester Castro at lcastroii@student.goodwin.edu. 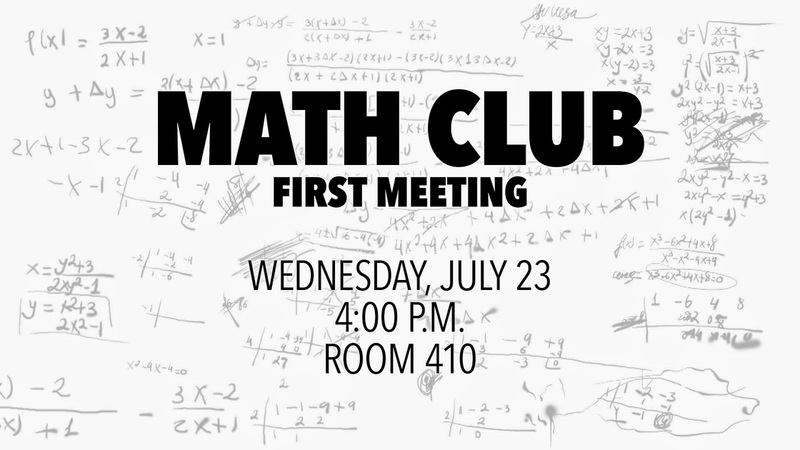 Newest Club on Campus Meets Today! $5 SWEATSHIRTS IN THE BOOKSTORE! For a limited time, the Bookstore has a selection of $5 hoodies! This season's Region 1 Club Soccer opponent list has been released, and again, the Navigators will be playing in the Constitution Conference. will have space available for a limited number of fans. Scholarships Now Available for the Fall 2014 Semester – Apply Today! The Goodwin College Foundation will be awarding $32,000 in scholarships, made possible by the generosity of donors, to go toward the Fall 2014 semester. Scholarships are given from the Foundation’s Endowed Scholarship Fund to students nearing the end of their program who demonstrate outstanding academic merit and financial need. To view the criteria and application requirements for these and other scholarship opportunities, please visit the Scholarships Webpage Don't delay — deadline for applications is August 8! A reminder that the Transition Food Pantry at Goodwin College is always accepting donations. In particular need at the moment are cake mix, frosting, kidney beans, juice, juice boxes, maple syrup, cranberry sauce,?corn, carrots, canned fruit, peas, Chef Boy-ar-Dee products, macaroni & cheese, jelly, stuffing, applesauce, canned chicken breast, Ramen Noodles, and canned soup. You can help by bringing your donation to the bin in the main lobby by the reception desk. 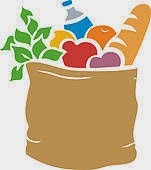 The Food Pantry can only accept unopened, non-expired, non-perishable food items. 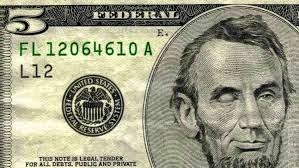 Checks made payable to Transitions Food Pantry or store gift cards can also be donated in care of Mike Rotondo. 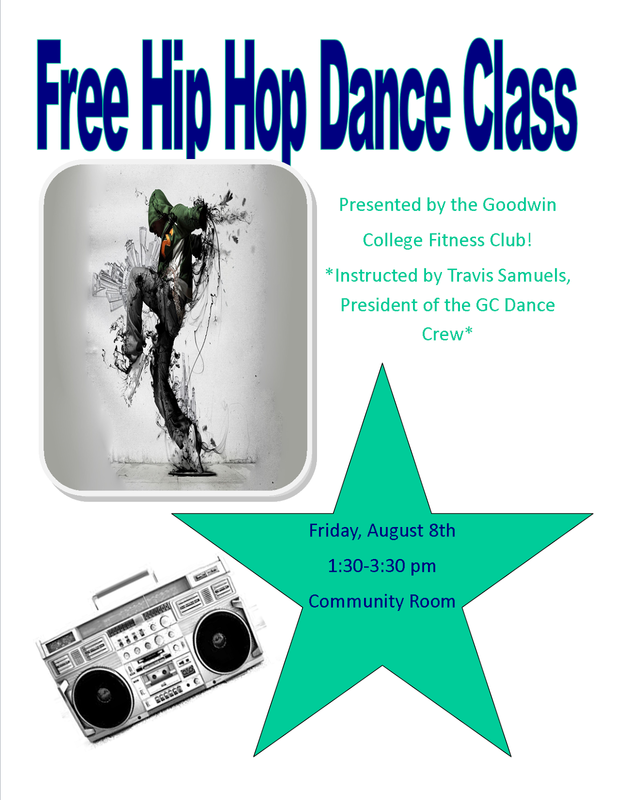 For more information, please contact him at 860-913-2026 or mrotondo@goodwin.edu. 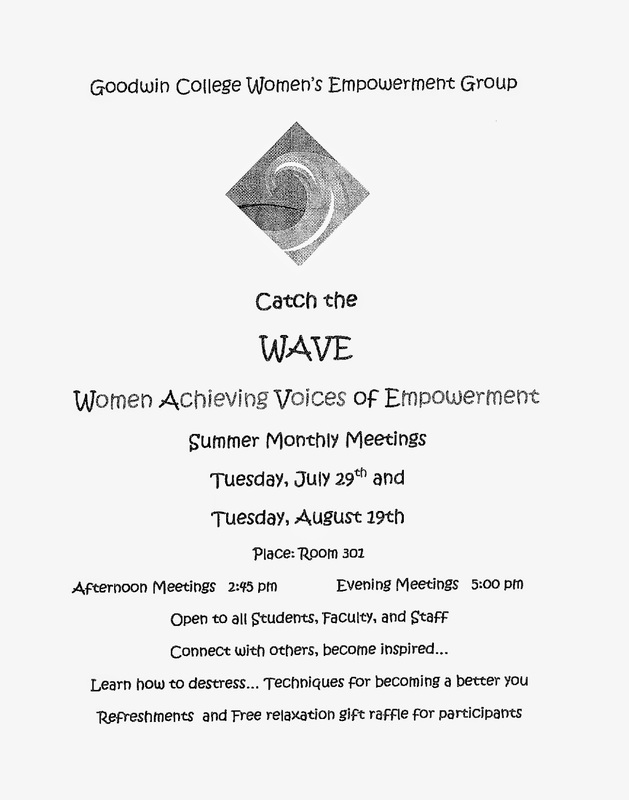 Women Achieving Voices of Power (WAVE) has scheduled its summer meetings for Tuesday, July 29, and Tuesday, August 19, in Room 301. Both dates include an afternoon meeting at 2:45 and an evening meeting at 5:00. Goodwin College’s new Professional Insurance Agents (PIA) Career Initiative will be launched at a special event on Wednesday, July 23, from 5:30 to 7 p.m. in the Community Room. Representatives from several local insurance firms will be on hand to speak about career opportunities throughout Connecticut. The first two classes in this initiative, Organizational Communications (OS 210) and Sales and Service I (BUS 125), will be offered in Mods 1 and 2 on Thursday evenings in the upcoming fall term. The two insurance classes will run in the spring, followed by the first paid externships next summer. You can also contact Dr. Ernie Varela at 860-913-2155 or evarela@goodwin.edu for more information on this initiative. 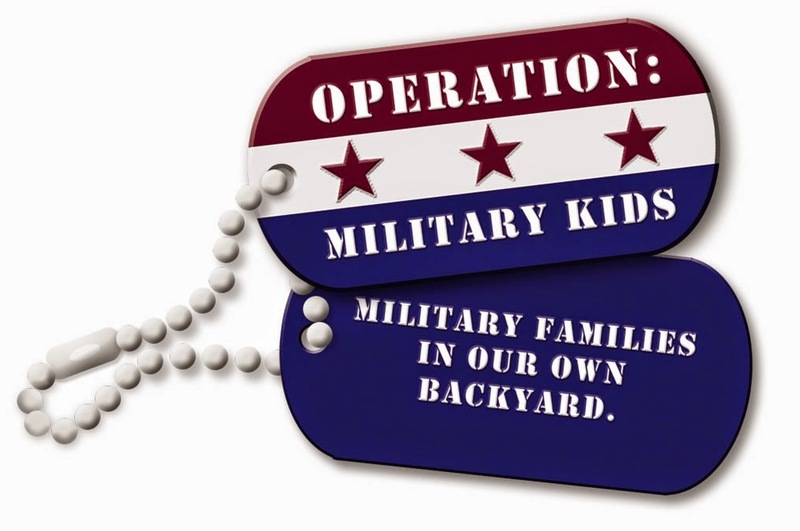 CT Operation Military Kids is offering a week of residential camp for military kids ages 7 to 13 at Camp CONNRI in Ashford, Connecticut, for $50 to $175 per person based on need. Camp CONNRI is committed to making it possible for any military- connected youth to attend. Children of active duty, reserve, National Guard, and veteran service members are all encouraged to apply. Deadline is Sunday, July 13. For information, contact Lisa Marcinkowski at lisa.marcinkowski@uconn.edu or 860-885-6106. There is still time to submit a creative work to the Poetry Club Contest. New deadline: July 30. 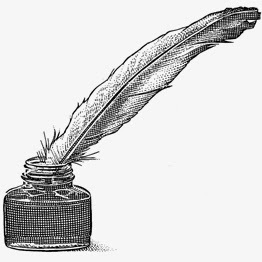 Students, faculty, and staff may submit up to three previously unpublished poems, no longer than one page each, on any theme. 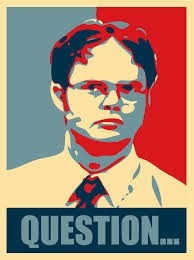 Submissions must be provided as Microsoft Word attachments; otherwise, they will not be considered. First Place, $75; Second Place, $50; Third Place: $25. First and Second Place winners will be published in The Beacon. Poems should be mailed to Cynthia McHale-Hendricks at CHendricks@goodwin.edu. We look forward to reading your work! 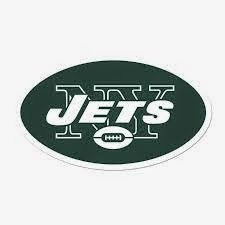 Coming soon...Watch the Jets host the 2013 AFC Champion Broncos. Sunday, October 12th. 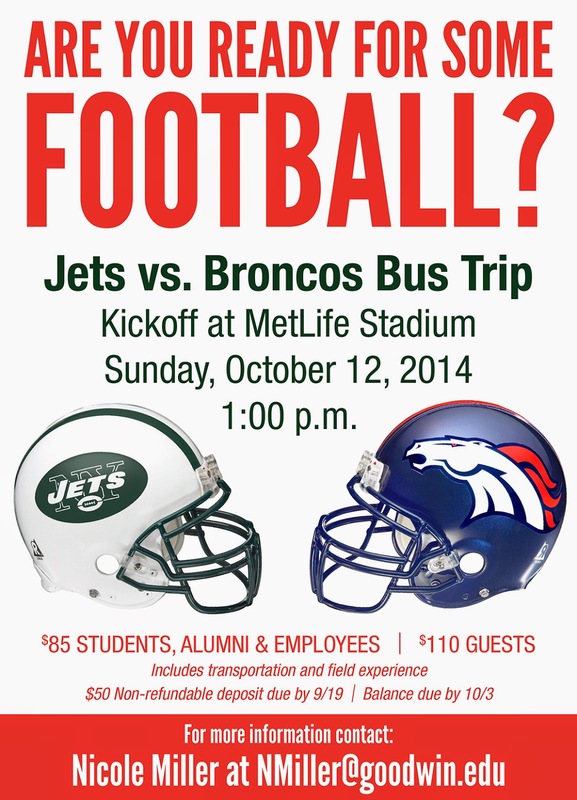 Check back for details on this annual trip to MetLife Stadium. 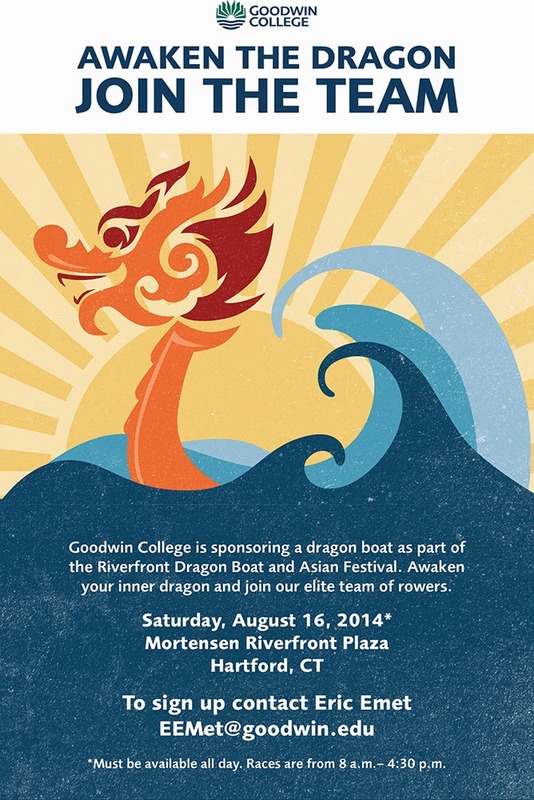 Goodwin College is once again sponsoring a dragon boat as part of the Riverfront Dragon Boat and Asian Festival. Awaken your inner dragon and join our elite team of rowers. 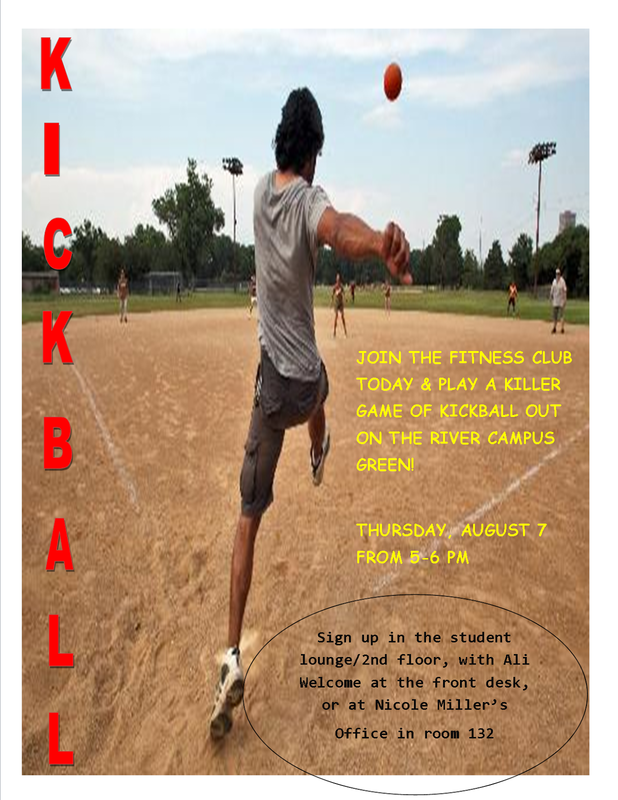 This is a great chance to enjoy the Connecticut River, get some exercise, and have fun with others from the Goodwin community! The event is Saturday, August 16, at Mortensen Riverfront Plaza in Hartford. Races are from 8 a.m. to 4:30 p.m. You must be available all day to participate. To sign up, contact Eric Emet: eemet@goodwin.edu. Have a question about Goodwin College? Looking for general information about the College, but not sure whom to contact? Try this great new service for students! Email ASK@Goodwin.edu (make live link) with your question and a Goodwin representative will have an answer or supply a contact for you within 24 hours. Fresh food, flowers, and fun return to Riverside Drive on Tuesday, July 8! As part of its continuing efforts to give back to the local community, Goodwin is proud to announce the return of the Farmers’ Market. The market will run every Tuesday through October from 3 to 6 p.m. in the parking lot between 133 and 167 Riverside Drive. The event is free and open to the public, and vendors accept SNAP and WIC. Tell your friends and family!